STRATFORD, ON – Ontario Beverage Network reports that a new brewery has opened in downtown Stratford. As reported here on CBN in June, Jobsite Brewing has been founded by local residents and former construction workers Phil Buhler and Dave Oldenburger. Jobsite opened its retail shop yesterday, and is selling bottles of four beers – 2×4 Cream Ale (4.8% abv), Wrong Nail Amber Ale (5.4% abv), Impact IPA (6.9% abv), and Big Pour Stout (5.8% abv) – and well as wood-fired pizzas to go. A full service taproom is set to open soon. 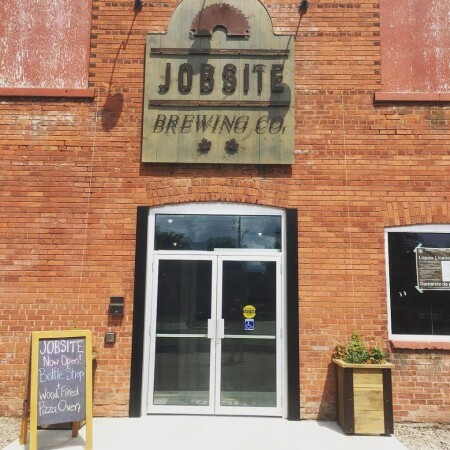 Jobsite Brewing is located at 45 Cambria Street in Stratford, and is open from 11:00 AM to 7:00 PM Tuesday to Saturday. For more details, see the brewery’s Facebook page.